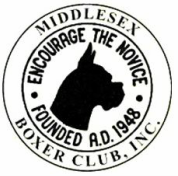 Bite and Jaw Structure: The Boxer bite is undershot, the lower jaw protruding beyond the upper and curving slightly upward. The incisor teeth of the lower jaw are in a straight line, with the canines preferably up front in the same line to give the jaw the greatest possible width. The upper line of the incisors is slightly convex with the corner upper incisors fitting snugly in back of the lower canine teeth on each side. Neither the teeth nor the tongue should ever show when the mouth is closed. The thighs are broad and curved, the breech musculature hard and strongly developed. Upper and lower thigh are long. The legs are well-angulated at the stifle, neither too steep nor over-angulated, with clearly defined, well “let down” hock joints. Viewed from behind, the hind legs should be straight, with hock joints leaning neither in nor out. From the side, the leg below the hock (metatarsus) should be almost perpendicular to the ground, with a slight slope to the rear permissible. The metatarsus should be short, clean, and strong. The Boxer has no rear dewclaws. White markings, if present, should be of such distribution as to enhance the dog’s appearance, but may not exceed one-third of the entire coat. They are not desirable on the flanks or on the back of the torso proper. On the face, white may replace part of the otherwise essential black mask, and may extend in an upward path between the eyes, but it must not be excessive, so as to detract from true Boxer expression. The absence of white markings, the so-called “plain” fawn or brindle, is perfectly acceptable, and should not be penalized in any consideration of color.